Claude W. Triplew was born in Missouri in 1907. He obtained a grammar school education. It was very common for many families in rural areas in the first half of the twentieth century to pull their children out of school to help them earn a living. This may account for Claude’s education level. Claude Triplew eventually migrated to San Diego County, California because San Diego was a growing metropolis with good job opportunities. Claude Triplew was a Christian. At the time of the 1930 census he lived in San Diego with his wife Hazel, and children June and John. He worked as a milker on a dairy farm, and eventually was promoted to the position of cattle driver by 1938. At some point his marriage to Hazel ended and he married Theresa M. Triplew, who is listed as his next of kin on his headstone and interment record. Weighing in at 140 pounds, standing at 5’6”, he was drafted in the U.S. Army on October 5, 1942. Claude Triplew left Missouri and moved to San Diego, California. San Diego was one of California’s early European settlements, which is why San Diego is often described as the birthplace of California. During the Great Depression, while the other areas of the United States were severely affected, San Diego was able to face the threats of the Great Depression better than many other cities because of its manufacturing businesses and also because of its location near international waters. This allowed for a thriving fishing industry, along with naval and seafaring enterprises. Because of the availability of jobs between the world wars, many people from across the country came to San Diego, which led to the shortage of homes, requiring rapid urbanization. San Diego was chosen as the site for the War Department's Army Division in the Southwest, dating back to 1917 and World War I. With a second conflict slowly approaching, San Diego once again became populated with a strong military presence. Because of the coastal bays in San Diego, the U.S. Navy, U.S. Army Air Force, and the U.S. Marine Corps established training facilities and aircraft factories which nearly doubled the population from 200,000 to 340,000 from 1940 to 1941. Many camps and industries in San Diego also played a big role in World War II. Camp Callan was built in 1940 to train artillerymen and anti-aircraft gunners, and Fort Rosecrans was built in twentieth century as a U.S. Army post at Ballast Point on the east side of the Point Loma Peninsula. The Consolidated-Vultee Corporation became one of the largest aircraft makers. At the start of the war, San Diego was also chosen as the headquarters of the Pacific fleet. As a Navy town, there was a constant fear of air and naval attacks. With the end of World War II, many veterans decided to make San Diego their new home. 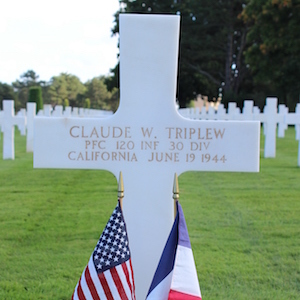 Claude Triplew belonged to the 30th Infantry Division, 120th Infantry Regiment. He was a private first class, so he was responsible for following orders from his platoon leader who held the rank of sergeant and any other commanding officer. 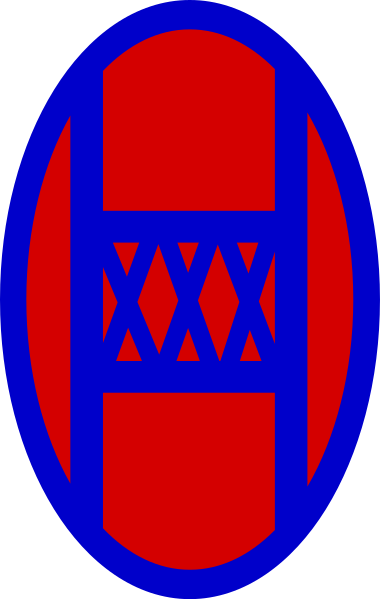 The 30th Infantry Division was nicknamed the “Old Hickory” in honor of President Andrew Jackson. The 30th Infantry Division was activated on September 16, 1940 and was assigned to Camp Atterbury, Indiana from November 10, 1943 to January 26, 1944. The troops trained in the United States for two years and were sent to England under the leadership of Major General Leland Hobbs. The 30th Infantry Division would be soon credited for its combat skills in Normandy, Northern France, Rhineland, Ardennes, and Central Europe. The 30th Infantry Division's first mission upon landing in France was to secure the high ground north of the Vire et Taute Canal in France, which was a success. Thereafter, the 30th Infantry Division was tasked to secure the crossing over the Vire River and to penetrate as far as Saint Jean-de-Daye. Claude Triplew was killed early in the Normandy Campaign on June 19, 1944, near the small town of Neuilly-la-Forêt. Hedgerows made advancing the front line difficult as the vegetation partitions between the properties could shield enemy movement. The 30th Infantry Division was in combat for a total of 282 days during World War II before being inactivated on November 25, 1945. By the end of the war, the 30th Infantry Division lost over 3,003 men killed in action. Over 13,000 were wounded, 903 were listed as missing in action, and over 1,000 became prisoners of war. 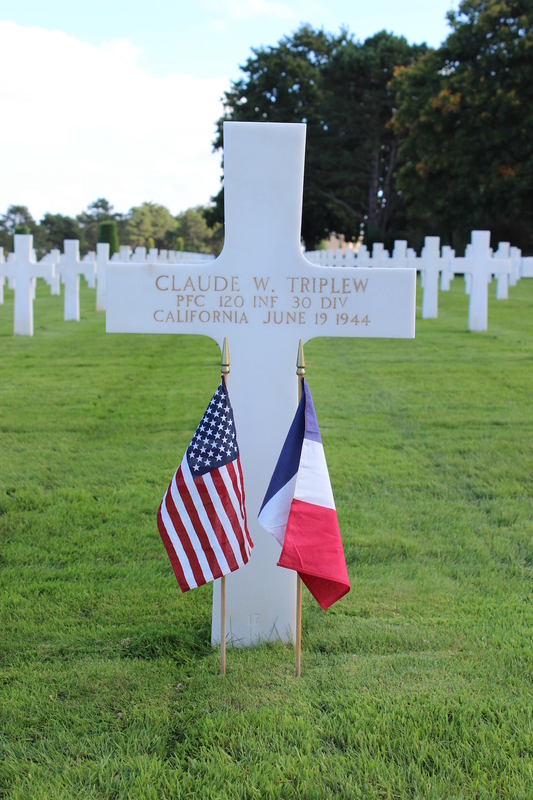 Although we have never met Claude Triplew in person, we can feel his love for his country through his brave actions on the battlefield. Through the selfless acts from our soldiers, our country was able to experience freedom and prosperity. Thanking and remembering these actions are important to us. Claude Triplew was born in Missouri, but eventually moved to San Diego, California. He married Theresa before being drafted into the U.S. Army on October 5, 1942 at the age of 32. Becoming a soldier means leaving your loved ones behind, your business, and your position in the society in order to defend your beloved country. Claude Triplew did exactly what a soldier is expected to do. He belonged to the 30th Infantry Division, 120th Infantry Regiment and was a private first class in the Army. We can imagine Claude Triplew’s wife writing letters as he was in training, wishing him the best luck. Her concern must have been heart wrenching upon learning about the D-Day invasion, knowing that he was probably part of it. Triplew fought in Normandy, France and lost his life on June 19, 1944. Although his life was short lived, he was able to bring and secure freedom for countless people, not just in America, but also for our allies in various countries. Claude Triplew will always be remembered in our hearts as an extremely brave young man who was able to stand up for freedom. Through the Silent Heroes project, we learned so much about the sacrifices that our soldiers made in order to protect the freedom of our people during World War II. The project was extremely important to us because we got to know our brave soldier, Claude W. Triplew. We are very proud to represent our soldier as a hero who fought so hard in the name of freedom. Looking through the pictures of war, my partner and I began to imagine the horrors our soldiers had to face when fighting on the front lines. We learned about the dangerous conditions and how our soldier, as part of the infantry, was likely covered in mud, saw his comrades perish in front of him, while also nervous as to what the next day may bring. It was also heartbreaking when all we found as tangible evidence of his existence was a single piece of paper that showed his name and his home in San Diego, California. We do not even know what he looked like. This project has given us a new perspective on the horrors of war and how much “ordinary” people had to sacrifice to protect our enduring freedom. Thanks to them, we are able to live a carefree life; we are forever grateful. Working on this project will always be remembered as special for us as we were able to shed light onto an unsung hero. 30th Infantry Division insignia patch. Wikimedia Commons. Accessed October 4, 2017. https://commons.wikimedia.org/wiki/File:30th_Infantry_Division_SSI.svg. Claude Triplew; World War II Army Enlistment Records, 1938-1946 [Electronic File], Record Group 64; National Archives and Records Administration [retrieved from the Access to Archival Databases at https://aad.archives.gov/aad/, September 29, 2017]. Claude Triplew. Headstone and Interment Records for U.S. Military Cemeteries on Foreign Soil, 1942-1949. Digital Images. http://ancestry.com. “30th Infantry Division Fact Sheet.” The 30th Infantry Division in World War II. Updated 1985. Accessed May 19, 2017. http://www.30thinfantry.org/history.shtml. “Claude Triplew.” American Battle Monuments Commission. Accessed June 19, 1944. https://abmc.gov/node/414241#.WJLP1fkrLIU. “History of Old Hickory.” The 30th Infantry Division in World War II. Updated 1985. Accessed May 19, 2017. http://www.30thinfantry.org/history.shtml. Osbourne, Richard E. "California in World War II: San Diego Metropolitan Area during World War II." California State Military Museum. Updated February 8, 2016. Accessed February 16, 2017. http://www.militarymuseum.org/SDWW2.html.